Close your eyes and press play. You’ve been thrown into a time machine, spun around a few times and transported back to the 60s. The Reprobettes play house to the Whiskey a Go Go, the iconic sunset strip nightclub in West Hollywood. The 5-piece girl group rock out fuzzy garage rock, surf rock and punk tunes, while go-go girls dance on the ledges above; all legs, painted faces and shimmer. 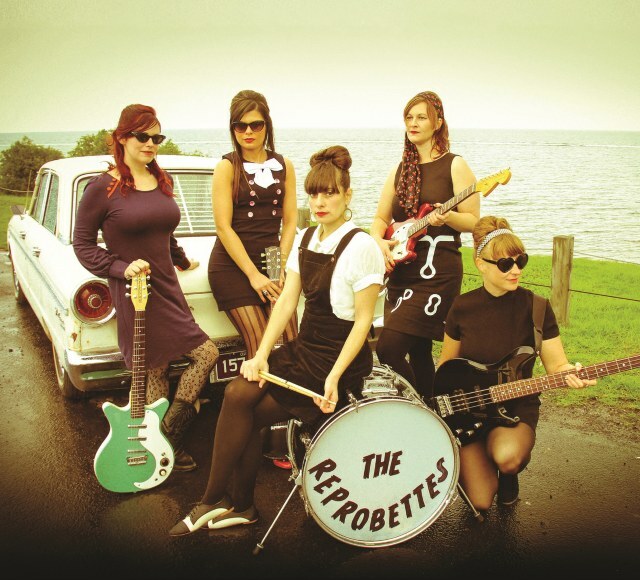 The Reprobettes are a delicious revival band, a throwback to the halcyon days of the Californian 60s. Formed in Melbourne in 2012, the all-girl growlers have been impressing audiences with their sassiness and wailing banshee screams. 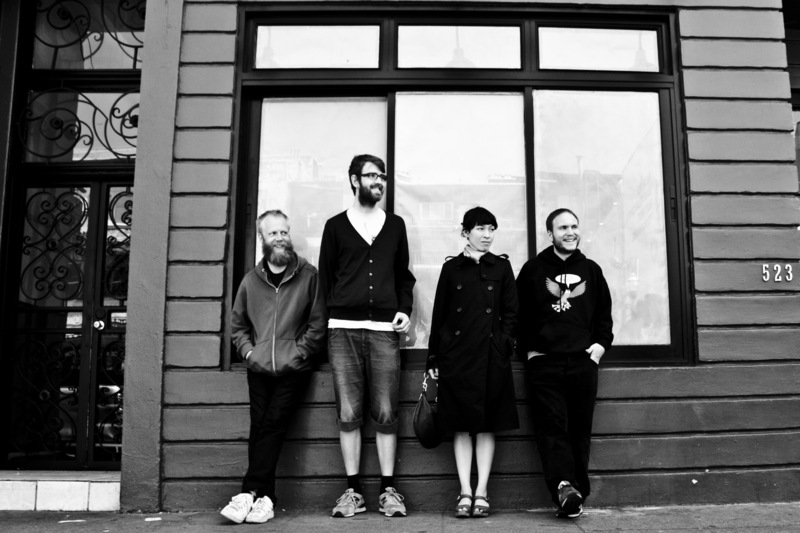 Their debut eponymous album is a decadent ode to female punk. Each song title has a sense of anarchy, whether its subtle or conspicuous and the lyrics are devoted to tales of sour relationships, liberation, rebellion and acceptance. The guitars are fuzzy, with the keyboard adjusted to organ mode, giving the record a vintage surf-rock flavour. Kat Karamitros and Sally Balhorn deliver vocals and harmonies reminiscent of The Belles and Linda Van Dyck. The album opens with a bombastic “Reprobettes Theme,” an instrumental that wouldn’t be out of place on the B-side of the Pulp Fiction soundtrack. Fans of the genre will be hooked instantly, with the rest of the album easily sounding like a Tarantino mixtape. It doesn’t come as a surprise then when you read online that the girls are incredibly influenced by The 5,6,7,8s, the kooky Japanese girl group who featured in Kill Bill. The album is comprised of nine originals and two covers, the latter reinforcing the girls’ affection for female rock and roll. “I Don’t Love You No More” by Continental Co-ets and “Stengun” by Linda Van Dyck are covered well here with the latter more bombastic and fierce than the original. Essentially a punk record, The Reprobettes is a groovy respite from the blatant and self-indulgent pop music of today. Originally published on The Iris. A Hitchcockian thriller in the country, Tom At The Farm is a grim exploration of homophobia, secrecy and family sustainability. Directed by Canadian filmmaker Xavier Dolan (I Killed My Mother, Heartbeats), the film is based on the play of the same name by Michel Marc Bouchard. Tom – played by Dolan – is a young copywriter who travels to rural Quebec for the funeral of his boyfriend, Guillaume. Upon arrival, he encounters a confused Agathe (Lise Roy) – Guillaume’s mother – who is unaware of Tom’s relationship to her son. Not sure whether to reveal the truth, Tom identifies himself as a close friend and comrade of Guillaume. That evening in bed, Tom is roughly woken by Guillaume’s brother, Francis (Pierre-Yves Cardinal), who reveals his awareness of his brother’s boyfriend. After Francis threatens Tom into playing out the “close friend” role for the duration of his stay, the plot develops into a sinister, passive-aggressive game of cat and mouse between the two, the sadistic Francis motivated by the need to protect his family name. Set in a desolate farmhouse, Tom At The Farm is hardly picturesque, artificially lit by harsh, cheap lighting. When filmed outside, the sun is barely visible, instead depicting a post-apocalyptic green- greyness that compliments the characters dour lives. It’s an alien town, devoid of human compassion and warmth. Francis and Agathe are isolated from the townsfolk, the former openly disliked by many. Trapped within the farmhouse – partly due to his own twisted affection for the brother that reminds him of Guillaume – Tom develops an ambiguous warped friendship with Francis that is eventually severed when Tom learns of Francis’ grave past. The film is Hitchcockian in its steady suspense, voyeuristic camera angles and passive-aggressive characters, both Francis and Agathe examples of the latter with their impassiveness and broodiness eventually erupting into hysteria by the film’s conclusion. Francis is determined to keep Tom imprisoned in the farm, his desperation motivated by a need to clutch onto his brother’s memory, a memory that was disrupted when Guillaume ran away from his childhood home. Both leading men deliver strong performances, their antithetical roles as predator and prey performed with conviction and realism. Dolan projects an innocent humility that contrasts sharply with Cardinal’s fierce hostility. Dolan is effeminate and timid, Cardinal is chauvinistic and intimidating. Although an undeniable brute, Cardinal’s Francis is somewhat ambiguous, his indirect affection for his mother, his bizarre fondness of Tom and his love of tango separating his character from the archetypal sociopath. Roy plays the grieving and detached Agathe well, her confusion in regards to her son’s “accident” and enigmatic social life gradually boiling over into a powerful emotional breakdown that leaves her innumerable questions unjustly unanswered. Delivering a perfect cast of almost inscrutable characters, Dolan as director has adapted a story of unforgettable presence. With a haunting score by Academy-award winning composer Gabriel Yared and contemplative cinematography by Andre Turpin, Tom At The Farm leaves its audience motionless by its climactic ending and surprising character development. 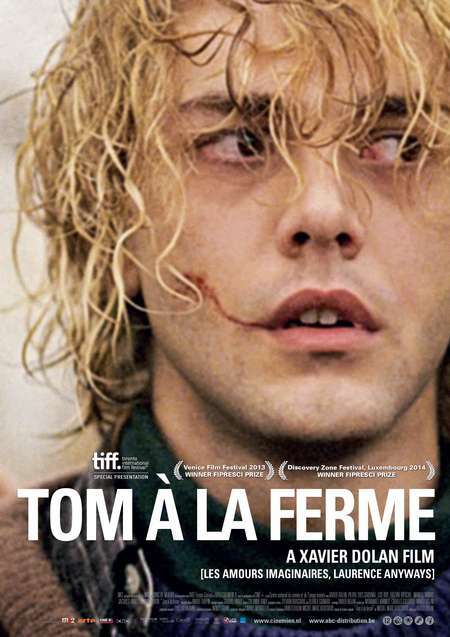 A brilliant film, Tom At The Farm is a disturbing, radical example of preservation.